May I wish you, slightly late, a Happy New Year. 2000 was rather dominated by our campaign to stop the building of a supermarket on the riverside site and at the moment we are preparing supplementary evidence to place before the Inspector when the inquiry resumes in March. Hopefully by the end of this year we will know the outcome of our endeavours. After March we will be able to give our attention to some of the other projects that we have had to put on hold, including the photographic record of all of the town’s listed building. At the Christmas Tree lighting ceremony the Society, in the form of John Bloomfield and Colin Reeve, learned a new skill: roasting chestnuts. They were very successful and were able to donate £47 to the Mayors Charity Fund. Those of us that enjoyed Clive Paine’s talk on Suffolk’s Tudor Rose will be pleased to note that we have booked him for this October to talk on the Reformation in Suffolk, using some of our Hadleigh wills. Our programme for this year is fully booked and we are already booking speakers for 2002. We expect to have a display again at the May Show and look forward to seeing you, both there and at our meetings. Drawn from the Autumn 2000 issue of Civic Focus. Full details from the HadSoc Secretary. 1. Higher skills in local authorities through training and professional development. 2. The duty of care on owners of heritage properties should be backed by improved tax incentives and grants. 3. Improve public understanding, particularly for young people. 4. Praise and reward good practices. 5. Research the social benefits of heritage management. 6. Strengthen regional identities through local networks and awards. 7. More encouragement, training and specific roles (as informal guardians) for civic societies. 8. Improve third party rights in planning. 9. National Government should set a better example in its own heritage activities. 10. Raise the standard of every park and green space. Unsightly visual clutter, which degrades the quality of the street environment, is how the Civic Trust describes a new rash of advertisements in British Telecom’s telephone boxes which began to appear in Spring of this year. By early October, Phone Sites, the company which sells the sites on BT’s behalf had placed advertisements in around 9000 boxes, some in conservation areas and adjacent to listed buildings. This is only a small proportion of the final number. The Civic Trust condemns the use of public telephone boxes as advertising hoardings. “British Telecom is pushing its luck”, says Mike Gwilliam, Director of the Civic Trust. “First it scrapped most of the K2 boxes designed by Giles Gilbert Scott and replaced them with utilitarian kiosks. Now the new boxes are being defaced with advertising clutter to make a quick profit. Blocking the view through the boxes conceals anti-social activity, making pedestrians feel insecure”. The Civic Trust also believes that the advertisements compromise public safety in other ways. Members of the National CCTV User Group have reported that criminal activity such as drug dealing, making malicious calls and phone box vandalism is taking place where the view of the interior of the box is obscured from CCTV surveillance. The Civic Trust is compiling a dossier of telephone box advertising. Readers are invited to send Ben Webster, their organiser, photographs of any examples found - telephone 020 7389 1375. On 28th November Clive Paine treated the Hadleigh Society to another of his inimical entertainments. Although supported by visual aids his performance upheld the best traditions of storytelling, recounting a story with a Suffolk base but much wider connections. Mary, Queen of France, ended her days as the Duchess of Suffolk, died in 1533 aged just 38 and was buried in Bury St Edmunds. As daughter of Henry VII of England she was educated in several languages in preparation for her role on the international dynastic scene. When she was 3 he engaged her to the Count of Milan in the typical way of cementing an alliance. As sister of Henry VIII she was very close to his affections, and his greatest warship, Mary Rose, was named after her. At 13 she went through a proxy marriage ceremony with Charles of Castile but when Louis XII of France was widowed Henry saw a greater opportunity for political gain and Mary went through the process of proxy marriage with the 58-year-old French king. Erasmus commented at the time that this would lead to England being united with all the states of Europe. The final ceremony was supported by casts of hundreds, with the Dukes of Norfolk and Suffolk playing leading roles. Charles Brandon, Duke of Suffolk even had to defeat and kill the German mercenary champion of the French court in the jousting that followed the ceremony. Mary’s coronation followed but 56 days later Louis died. Once it was clear that Mary was not pregnant she again became a political property to be traded, but pre-empted by persuading Charles Brandon to marry her secretly. Charles had been brought up in the Royal Court and it is quite possible that he had always been Mary’s true love. After protracted negotiations to return to England the couple finally confronted Henry, and at some cost of land, Charles made his peace with the King. The couple lived in London at Suffolk Place in Southwark, and at several properties around Suffolk, including at Westhorpe beyond Stowmarket. Mary continued to use the title ‘Queen of France’ and this may well be the origin of many ‘Queen’s …’ place names around the county. We learned last month of the mediaeval rituals associated with death but Mary’s surpassed all that, with a procession of 1500 people from Westhorpe to Bury. Neither Charles nor Henry was at the burial, having other business and Charles married within months. In 1545, when the Mary Rose sank, Henry asked Charles to organise its salvage. He visited the scene, and died in his bed that night. It was not until Victoria’s reign that the British royal family fulfilled Erasmus’ prediction. I need make no disclaimer about the head, for I was not born in Suffolk. My father was a Worcester man who came to this county to be Rector of a pair of small villages near Kessingland when I was 12½, and since then I have only lived elsewhere when at school or college. As for being strong in the arm? Well, as I have often said, ‘The Lord gave me good muscles, and my father taught me how to use them!’, for my inclinations from childhood have been practical rather than academic. My ministry began in 1938 at Bramford and, when war came, school boy military training came in useful for arms drill with our Home Guard collection of Boer War relics and shot guns: of the kind now seen on pub chimney breasts. Later, the Bishop sent me to Halesworth, whereas he had been asked to allow me to apply for a naval chaplaincy. Halesworth had once been connected to the sea via some locks built on the river Blyth. Both there, and at Bramford, days off and holidays were spent working on farms, and working an orchard to pay the rent of a house. In 1944 there was a mini tornado that had sheets of lead on the church roof flapping like wet dishcloths, and much fun was had hanging from the end of a rope as they were beaten back into place. When VE day came the organist’s son was sent up a ladder to reeve a new flag halyard, and it was not until he had done so that we discovered the wooden pole was as rotten as the proverbia1 pear, and the boy could easily have been catapulted onto the nave roof 40 feet below. This required a rush job fabricating a steel mast some 30ft high at the local engineering works: also a l4ft x7 ft wooden cross, stayed by army telephone wire, and illuminated by a pair of enormous old fashioned car headlamps. These made a fine sight from the A12 at Blythburgh. In the summer of 1946 I moved to Stratford St.Mary and strict instructions were left about the very temporary quality of the sash cord holding the l6ft topmast of the flagstaff, and the wire guys of the cross. Unfortunately these were not heeded: another gale caused the cross to sail over the churchyard like a glider, and the descending topmast to punch a hole in the roof of the tower. At Stratford the rectory, bought in 1938, was an enlarged cottage that was standing in 1442; it was a wet summer, and an apron of roofing felt had to be spread across the front bedroom floor to let the water out through a hole knocked in the wall; and the aforesaid wall had to be shored up by a pair of young elm trees cut from the paddock; until it could be underpinned and the bulge held with tie rods. Work on the poor old place lasted three years, and after 15 a new one was built to my late wife’s and my design. I was moved into Hadleigh as assistant curate in March 1972 and began to learn something of local politics - an interesting subject - and Hilary and I were married in the early summer to live at No. 5 Brett Avenue. 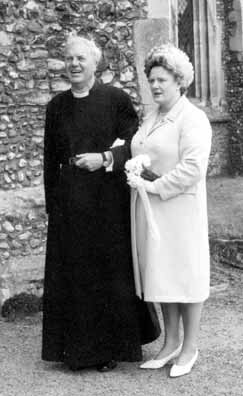 She was regularly placed in charge of the Ipswich Hospitals as deputy matron, but our marriage survived the disconnected timetables of church and medicine until, on the eve of my 60th birthday, the Bishop sent me to five small and very independent parishes North of Wickham Market. There he suggested we ‘camp out’ in one of the two vacant rectories until another should be built: meanwhile £50 was handed over to put our choice to rights. But we only camped out on holidays so, once again the house, a lovely, late Georgian mansion this time, had to be attended to: it was about 11 years before a new one was acquired. After 5½ years the soles of my shoes were becoming thin; and since Hilary’s house in Church Street needed much doing to it, and retirement age was past, I retired; to become architect, carpenter and joiner once more. My ordination vows had nothing to do with bricks and mortar; but, in between equipping two churches with heating, their church halls with loos, and myself with accommodation, the attempt has also been made to present faith in Christ Jesus as a sensible way to resolve many difficulties. In retirement here I became a founder member of our Society and its first Chairman. Now, having recently past four score years and seven, the attractions of a more comfortable chair and a good book are hard to resist. It is important to know when to retire! This year is the two hundredth anniversary of the first census of the United Kingdom. Except for the war years a census has been taken every ten years. The full details collected for each household become available to the public only after a 100 years. When, in the 1980’s, we started putting Hadleigh census data into a computer we chose the most recently available, which was for 1881. 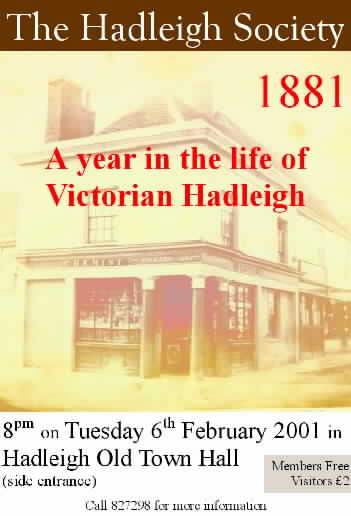 In 1987 we used this data, together with information from the Hadleigh Archive and the Ipswich Record Office to put together a presentation to the Society describing life and some of the events in our town during the year of 1881. Find out why a woman died because her husband didn’t have a Guinea, why the schools were closed for seven weeks, why the fire brigade couldn’t get to a fire in Aldham, why a petition was raised by residents in the High Street, who’s servants included a Lady’s Maid and a Footman and where was the shop we’ve used as our poster? Nominations should include details of the improvement made or of work carried out and should be sent to reach the Hon. Secretary, The Hadleigh Society c/o 134 Benton Street, Hadleigh, Suffolk, IP7 5AZ, by 1st April 2001. From time to time we get requests from people whose family used to live in Hadleigh. Sometimes they want to learn more about Hadleigh or about their ancestors. Here are some of these calls for information; if you can help then please contact the website editor, Graham Panton (see details on back page). I am descended from Rowland Taylor and would like to find out more about the family and Hadleigh in general. When my grandfather died about 40 years ago, we lost all contact with his family in the UK. I am trying to find out some information about Reverend Mason, whom I understand was a pastor in the town. He painted some wall panels at Odds and Ends on the High Street. I am a local amateur historian in Somerville, Massachusetts. In 1630 John Winthrop of Groton, the first Governor of the Massachusetts Bay Colony, established a farm here in what was then known as part of Charlestown. I am seeking to research the history of Winthrop's home in Groton, particularly the topography of Groton and of the Winthrop property at Groton Hall or Groton Place. We are searching for a Paleologus family. My wife may be a descendant of this famous Greece family. One of them had married with Mary, daughter of William Ball of Hadleigh in Suffolk in Cottingham, 1st May 1600. Please can you tell us something about this woman and her family: where did they live, is there a picture available about the wedding, where was the marriage, in which church, did they have children, where came this Paleologus from(we did hear from Italy), where did they live? Thanks a lot for your help. Having just come across your web site I was wondering if any photographs of the Hadleigh Royal Observer Corps Post ever turned up. I am searching for data that would help me build this family history of mine. Seems my grandparents met and married while they were in service about 1893, perhaps in London, as that is where they both were working. My grandmother was the pastry cook for some doctor and I believe my grandfather worked at a harness shop. No documentation, just family stories. Shortly after they married, moved to Canada and started a new life for themselves and all connection with the UK just stopped. Funny this should happen as I know my grandmother had a large family. We have a picture of all of them. Back of the old postcard says Aberystwyth, Wales. A young family, late teens or twenty-somethings and one very old woman, perhaps their mother. Searching for record of the birth of Edward William Mann, born March 4, 1875, Hadleigh Heath, Suffolk, England. My own Dad is in his 90th year and never had any family to speak of except his own immediate one. Makes one start to think of their own mortality etc. Would be great to find some documentation regarding Edward William Mann. It would give our roots just a little more depth, if you know what I mean. I do have his Statement of Service in the Canadian Armed Forces WW1 and on this document it lists Hadleigh Heath as the place of birth. Any information that you could come up with will be very much appreciated.